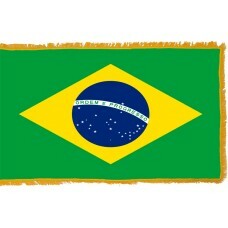 The Brazilian Flag was officially adopted on the November 15th, 1989. It has a dark green background with a large yellow diamond in the middle. In the center of the diamond is a blue globe that features 27 white, 5-pointed stars and a band that reads, "ORDEM E PROGRESSO" (order and progress). 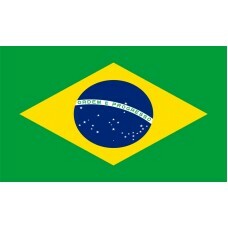 The Brazilian flag is very symbolic to the country in all aspects. The dark green color represents the agriculture, fields and forests in the country, the yellow diamond is symbolic to the wealth from gold as Brazil provided the majority of the world's gold in the 18th century, following its discovery in 1695. The stars represent the sequence of the stars that were seen on 15th November 1989 from Rio De Janeiro, the same day the country transformed from an Empire into a Republic. The flag is sometimes referred to as "Auriverde" which translates as golden-green. The flag has been slightly modified over the years as originally, there were only 21 stars, used to symbolize the 21 states. However, the larger states were gradually divided into smaller states and extra stars were added to the flag. The last time the flag was modified was on May 11th, 1992, when an extra 4 stars were added. In 1500, Brazil was claimed by Portugal and was ruled until it gained independence on September 7th, 1822. From 1822-1989, Brazil was ruled under various Brazilian Empires and the flag was changed frequently. However, the flag today, is derived from the last flag used during the Empire. Brazil is the largest country in South America and it is the 5th largest country in the world. Its capital city is Brasilia, although Rio De Janeiro was the capital city until 1961. It is a very popular tourist destination, as it is home to the Amazon Rainforest, the biggest rainforest in the world. The rainforest has more animal species and life than anywhere else in the world. Rio De Janeiro, which is one of the more popular destinations is also home to many beaches and fantastic sights, as well as its famous landmark, "Christ the Redeemer Statue." As well as having the largest rainforest in the world, it also has the second longest river in the world, The Amazon River. A lot of tourists who visit the country will aim to visit during the time of the carnival. The carnival in Rio De Janeiro has been referred to as the "world's largest party," and is very popular amongst tourists. In 2017, approximately 1,000,000 tourists visited the country for the carnival. It begins on the Friday afternoon (51 days prior to Easter) and ends on Ash Wednesday. During this carnival, there are approximately 2,000,000 people on the streets and the majority are dressed in very fancy and detailed costumes with thousands of dancers and floats parading the streets. shone in our homeland's skies at this very moment. our chest shall defy death itself! the image of the (Southern) Cross shines resplendently. and thy future mirrors thy greatness. illuminated by the sun of the New World! "our life" in thy bosom "more love". nor does he who loves thee fear death itself.